Riding 2.6 million pounds of ground-shaking thrust, an Ariane 5 rocket lifted off from the South American jungle Friday and delivered communications satellites into orbit to reach customers in Asia, the Middle East and the Indian subcontinent. Trailing a plume of golden flame, the 16-story Ariane 5 ECA rocket left the Guiana Space Center launch pad at 2038 GMT (4:38 p.m. EDT) and disappeared into a hazy, mostly cloudy sky about a minute later. The Ariane 5's two powerful solid rocket boosters burned out and separated a few moments later. The rocket's core Vulain 2 main engine continued burning hydrogen fuel for the first 9 minutes of flight before shutting down and falling away at an altitude of 116 miles over the Atlantic Ocean. A cryogenic upper stage accelerated the mission's ST 2 and GSAT 8 satellite payloads to a velocity of more than 22,000 mph. The 11,217-pound ST 2 spacecraft was deployed from the Ariane upper stage 27 minutes into the mission. After releasing a Sylda dual payload adapter, the launcher jettisoned India's 6,819-pound GSAT 8 satellite at the flight's 31-minute point. The Ariane 5 rocket achieved an orbit with a high point of 22,332 miles, a low point of 155 miles and an inclination to the equator of 2.5 degrees. Jean-Yves Le Gall, Arianespace's chairman and CEO, declared the launch a success in a speech a few minutes later. "As you just witnessed, this 58th Ariane 5 launch has lifted and placed into (orbit) ST 2 and GSAT 8, which makes me very happy," Le Gall said. It was the 44th consecutive success for the Ariane 5 rocket family since 2002, a period in which the launcher has hauled commercial communications satellites, scientific observatories, military payloads and supplies for the International Space Station. The ST 2 and GSAT 8 spacecraft delivered to orbit by Friday's launch will serve Asia, the Middle East and India. "We are particularly happy to support the development of one of the most vibrant regions of the world," Le Gall said. 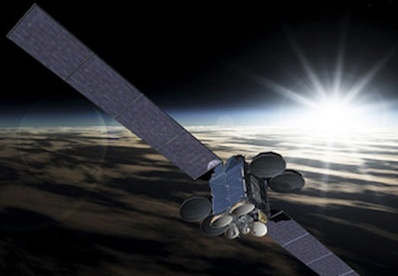 ST 2 will be operated by ST 2 Satellite Ventures, a joint company formed by Singapore Telecommunications Ltd., or SingTel, and Chunghwa Telecom Co. of Taiwan. Artist's concept of the ST 2 satellite in orbit. Credit: Mitsubishi Electric Corp.
"We have overcome many challenges to come to this point," said Titus Yong, vice president of SingTel Satellite. "As we see and hear ST 2 roar into outer space, we know it has been well worth the journey." ST 2 was manufactured by Mitsubishi Electric Corp. of Japan, the first satellite built by Mitsubishi for the international commercial market. The spacecraft has a design life of 15 years. Three engine burns by ST 2's on-board propulsion system will circularize its orbit at an altitude of 22,300 miles over the equator in the next five days. Testing of ST 2's communications instruments should begin around June 1 before the satellite goes into operational service in July, according to Mark Blair, the spacecraft mission director for ST 2 Satellite Ventures. The craft's final position in geosynchronous orbit will be at 88 degrees east longitude. ST 2 replaces and expands communications services provided by ST 1, a satellite launched in 1998 that is now at the end of its design life. Customers will use ST 2 for Internet-based fixed and mobile communications services, including voice and data products for businesses such as direct television broadcasters and maritime companies in Asia and the Middle East. ST 2's communications payload includes six antennas, 41 Ku-band transponders and 10 C-band transponders. 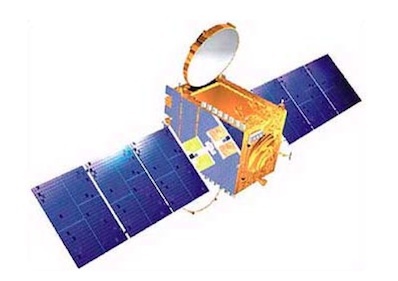 India's GSAT 8 satellite will be ready for communications duties by mid-June to start a 12-year mission beaming broadcast and navigation signals. It will be parked along the equator at 55 degrees east longitude after a series of rocket burns to guide GSAT 8 into the correct position in space. "GSAT 8 is one of the heaviest and highest powered satellites that ISRO has ever built," said K. Radhakrishnan, chairman of the Indian Space Research Organization. The spacecraft will augment India's INSAT communications satellite fleet. "The next phase of the voyage will be more crucial," Radhakrishnan said. "The user community in India is looking forward to the operation of the 24 Ku-band high-powered transponders." GSAT 8 will be used for direct-to-home broadcasting, data collection, news-gathering and other domestic needs. The satellite also carries a radio navigation instrument called GAGAN to augment GPS navigation signals. It is the first of multiple satellites with the GAGAN payload, which is designed to improve air navigation in India. The next Ariane 5 rocket launch is scheduled for early July with the European ASTRA 1N satellite for SES ASTRA and the BSAT 3c spacecraft for B-SAT Corp. and SKY Perfect JSAT Corp. of Japan.